Mr. Joe Ghartey, Minister for Railway Development, has appealed to chiefs to assist his ministry to reclaim encroached railway lands. He expressed worry about the massive encroachment by private developers on its lands, something he said, needed to be tackled, especially as many investors expressed interest in putting their money into the re-development of the existing railway lines. He also asked the chiefs to be ready to make available land for the construction of additional railway lines across the nation to transform the transportation system and enhance socio-economic development. He was addressing a meeting of the National House of Chiefs (NHC) in Kumasi. Mr. Ghartey spoke of the determination of his ministry to take firm and urgent steps to reclaim all of its lands to pave way for smooth re-construction of the railway lines. He announced that they had targeted to construct 1,394 kilometres of railway lines by October 2020. A total of about 4,000 kilometres of railway lines would be constructed under the railway redevelopment master plan. The Minister indicated that rail transportation was unique and had the potential to open up the country and speed up socio-economic transformation of communities along the lines. He told the chiefs that they were working to position Ghana as a prime location for expertise in railway construction in Africa. 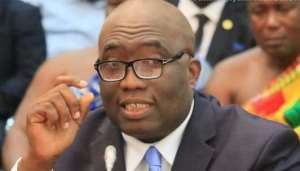 In line with this, the Paa Grant University of Mines and Technology at Tarkwa had developed nine railway-related courses to train young engineers for the sector. He also spoke of the refurbishment of coaches to put them back on the tracks. Mr. Ghartey said they would go the extra mile to make sure that the goal of redeveloping the rail transportation system was achieved within the shortest possible time. The chiefs applauded the government for its efforts to resuscitate the rail transportation system and encouraged the Minister to work with zeal and passion to make this a dream come true.